Tighter leg – Even though I cut the stitch count down to 60 or so, it was still too loose. I think that might have been because of the ruffles I added at the top, so maybe it was okay. I definitely won’t be adding very many ruffles from now on. I prefer either a really long or really short stocking. 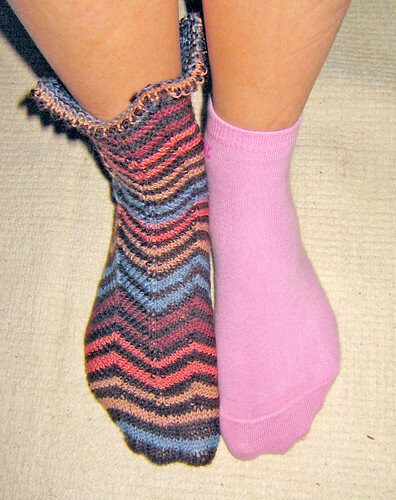 Summer socks or winter socks; Canadians don’t really have a very substantial autumn or spring. So I could try this as an ankle sock, perhaps. I’ll have quite a bit left of this yarn, so hopefully I can squeeze an ankle sock out of it. Is that a Jaywalker? That’s a Jaywalker! BING BANG BOOM! ZING ZANG ZOOM! Captain, I’m sensing… pain. And socks. For the record, I’m watching a Jeopardy episode and there’s this college kid talking about Marina Sirtis (also known as Counsellor Troi) coming to his hometown when a Star Trek convention came there and about how stoked he was, and he’s got a seriously comical Southern drawl and IT IS HILARIOUS. 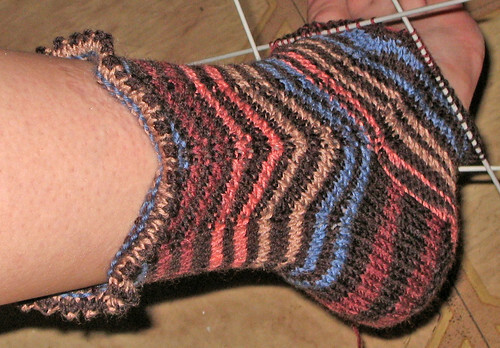 Here is a universal sock pattern. 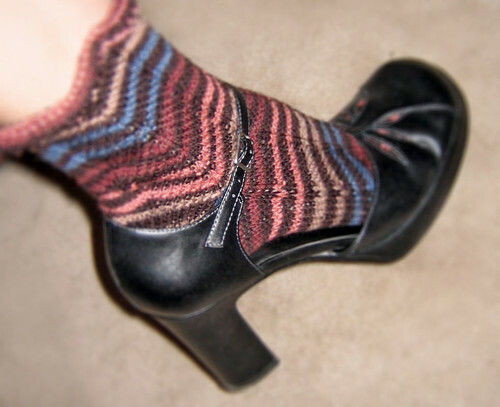 I believe I will use it to create my own sockular magnificence, after I finish the Jaywalkers I’m knitting now. They just had a question about Danica Patrick! GIRL POWER!